Q&A: How Do You Eat Right? – Portion control: First and foremost it is essential to eat the appropriate amount of calories. Eating 5000 calories a day is unhealthy, regardless if it’s pizza or quinoa with kale. Moderation is key. 2000 calories is a good number for most people but bigger guys who are active may need more, small women may need less. It is better to eat small meals (or snacks) 4-5 times a day than 2 whopping meals. Spikes in blood sugar after huge meals lead to more generation of fat. – Food is cooked not manufactured: Processed packaged foods are not good for you. Avoid them or have them in moderation. A good rule of thumb is shop mostly on the outside of the grocery store, not in the aisles. Fresh fruits and vegetables should be mostly what you eat. Frozen veggies are better than canned, but fresh is best. -Learn to cook: Making food for yourself allows you to control what is in it. Appreciate the time it takes and be mindful of what you put in your body. Food from natural ingredients made for you, by you brings health to the mind and body. – Brown carbs > white carbs: Eat whole grain when you can (everything comes in whole grain now so this isn’t hard). This goes for rice and potatoes too. Brown rice is better than white rice, sweet potatoes are better than normal ones. The more plant matter in your grain, the slower you will digest it and the less fat you make with it. -Dairy and fish are great in moderation: Have a little bit of dairy and fish. Beware- frying fish removes all those good “fish oils” and replaces them with the cooking oil. Grill or bake those fillets. Red meats have lots of saturated fats. Poultry can be lean but watch out, chicken skin makes chicken just as bad as a steak. -Salad is not always best: Why starve yourself when that dressing has more fat than a burger? A turkey sandwich on whole wheat bread is often a healthier choice than a cheese salad slathered in fatty blue cheese, ranch or Cesar dressing. -Nuts and yogurt are your friend: These are great healthy sources of fats and proteins which are essential. They can also make great on-the-go snacks. Watch out for sugar added to or coating both nuts and yogurt. You could be getting lots of sugar with out knowing it. -Sugar is in everything and is why Americans are obese: be wary of how much sugar is in something. Soda, sweet tea and juice cocktails such as fruit punch, lemonade and even minute maid orange juice is a dessert, not a drink. Avoid these, think of them like a slice of cake because they have as much sugar. My favorite author about food is Michael Pollan and he has many books that have really shaped how I feel about food. Some of his books talk about personal diets where as others talk more about the philosophy and development of food in this country. If you have any question about your health or things I say in the blog or on the air, please email me. I love hearing from listeners, and I will reply to your emails. 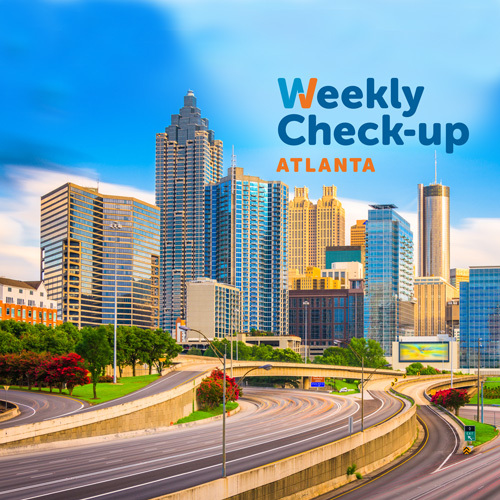 https://weeklycheckup.com/wp-content/uploads/2017/11/atlanta_500x500-1.jpg 500 500 johnlenz https://weeklycheckup.com/wp-content/uploads/2018/01/wcu-logo.png johnlenz2012-02-23 19:27:292017-11-27 18:39:24Q&A: How Do You Eat Right?